Regular volunteer trips with Kindness in Action, wildlife photography and mountain biking feed my soul. I love being a part of something bigger. Seeing the world and being able to help make positive change is one of the great things about being a dentist. I was born in London England to parents wise enough to emigrate to Canada early in my life. Originally we moved to Vancouver where my father was offered a position at the UBC Faculty of Dentistry but quickly moved to Winnipeg where my father worked at the Health Sciences Center Dental Department. My parents were shocked to find that the career advisor had lied about the warmer climate and better alpine activities in Winnipeg. Having spent formative time in BC. as a child I counted the days until I could return. Upon completion of my Dental degree and a one year Hospital internship at the Health Sciences Center my Partner Sherri and I loaded up the car and moved to Fernie. For those who haven't met Sherri you should simply know that Everything I have in this life I owe to the love of that amazing woman. Sherri is my rock, she is my inspiration and my love. The plan in 2001 was to work in Fernie part-time and in Cranbrook part-time. Well it's true, if you want to make God laugh just tell him your plans... Those plans quickly came to an end when the decision was made to purchase Baker Hill Dental and since 2002 I have devoted my time almost exclusively to Cranbrook. I say almost because from time to time, in addition to the charitable work we perform in Cranbrook, we provide dental care to third world countries and I volunteer teaching at the University of Saskatchewan. I credit my parents with providing a strong moral upbringing for me. I try to integrate their teachings into all of my interactions. The eight years I had the pleasure of working with my father are the greatest gift this life has given me so far. Despite my father's passing in 2009 his presence will always be felt in Baker Hill Dental and I will continue to strive to be worthy of his name. My approach is simple, treat everyone how I would hope to be treated and always remember that my dad is looking down on me knowing I will do the right thing. I look forward to meeting you and hearing about your life. Monika was born and raised in Wrocław, Poland. Her family moved to Canada in 1990 settling in Regina, SK. She spent 3 years working on a Bachelor of Science degree in Chemistry at the University of Regina (where she met her husband Rob). Being admitted early, she transferred in 1996 to the University of Saskatchewan in Saskatoon to begin the 5-year Dentistry program. In the final year of her DMD she took a one-month volunteer practicum in Mexico City. Experiencing the desperate need for oral health in one of the world’s poorest cities helped focus her intent on patient care. She met this same need for the 5 years following her graduation in 2001, in Prince Albert, Saskatchewan. It was in P.A. that she honed her skills in both oral surgery and chairside-manner, becoming known as the “gentle dentist”. Returning to Regina in 2006 to be near family, she joined Capital Corner Dental, where in 2007 she gave birth to a set of beautiful twins, Spencer and Natalia. The allure of a mountain lifestyle and slower pace of life, however, kept creeping into her consciousness. After falling in love with the alpine town of Kimberley in her first year of university, she had been visiting the area every year since. It was during those two decades that the call of the mountains beckoned. 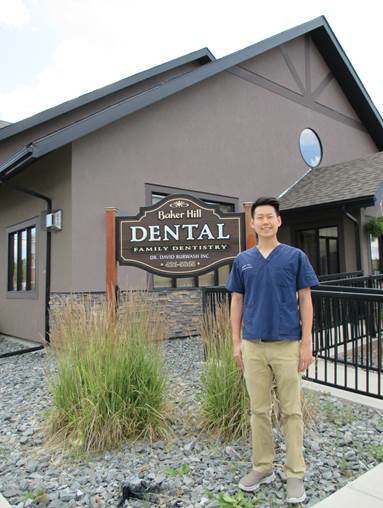 The East Kootenays became the focus of her dreams, which finally came true when she was given the opportunity to join Dr. Dave Burwash at Baker Hill Dental in Cranbrook. Dave and his entire office have the same philosophy of practice as Monika. They are focused on true patient-care (what is best for their patients based on their individual case, needs, and situation). This is paramount in the way that Monika approaches the profession of dentistry. The friendly and hard-working people at Baker Hill Dental reflect that vision, and allow her to treat her patients with care and compassion. It is icing on the cake that she is able to do this for the wonderful people of the Cranbrook area that have welcomed her with open arms. Monika, with that same spirit, welcomes new and returning patients looking for quality oral health treatment. I was born and raised in Taiwan, a small island country situated in Southeast Asia with the size of Vancouver Island and two-thirds of Canada’s population. Our family immigrated to Canada in 2005 and we settled down in Comox, B.C., thus I am no stranger to small town life. In 2007, I moved to Vancouver to further pursue my education in science, which I eventually completed my Bachelor of Science with a major in Biochemistry in 2011 at University of British Columbia. In the same year, I continued my education with training in dentistry at UBC. In 2012, I married my best friend, Yiwen, who I have known since high school in Taiwan. I am extremely lucky to be able to spend the rest of my life with this really special lady. In my 4 years of dental training, I particularly enjoyed taking part in various study clubs and community service trips. We would travel to different underserved communities in the lower mainland to volunteer our time to serve those who desperately needed dental care. I especially enjoyed continuing this passion on the Humanitarian trip to Guatemala in 2016 with the Baker Hill Dental team. I am excited to meet you all and can’t wait to learn more about the city of Cranbrook and the people here.